The carcass of the cougar has been sent for examination by officials at Washington State University in Pullman. The animal was stalking the cyclists and was acting abnormally, Fish and Wildlife officials said. The cougar that attacked two bicyclists near North Bend on Saturday, killing one and leaving the other with serious injuries, was “emaciated,” according to a fish and wildlife official. Capt. 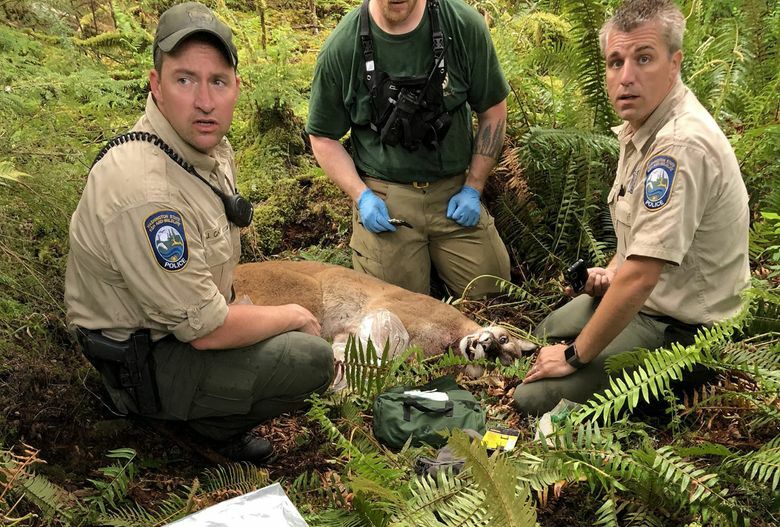 Alan Myers, of the state Department of Fish and Wildlife police, said the brain of the 100-pound cat will be tested to determine why it attacked the cyclists, the first fatal encounter between a human and a cougar in the state in nearly a century. Myers said the carcass of the cougar was transported Sunday to Washington State University in Pullman, where a veterinarian will conduct a brain necropsy to determine if the cougar was sick. Cougar attacks on humans are extremely rare. Myers confirmed the identities of the victims as S.J. Brooks, 32, of Seattle, and injured friend Isaac Sederbaum, 31, also of Seattle. The King County Medical Examiner’s Office will formally identify the victim after an autopsy is performed. 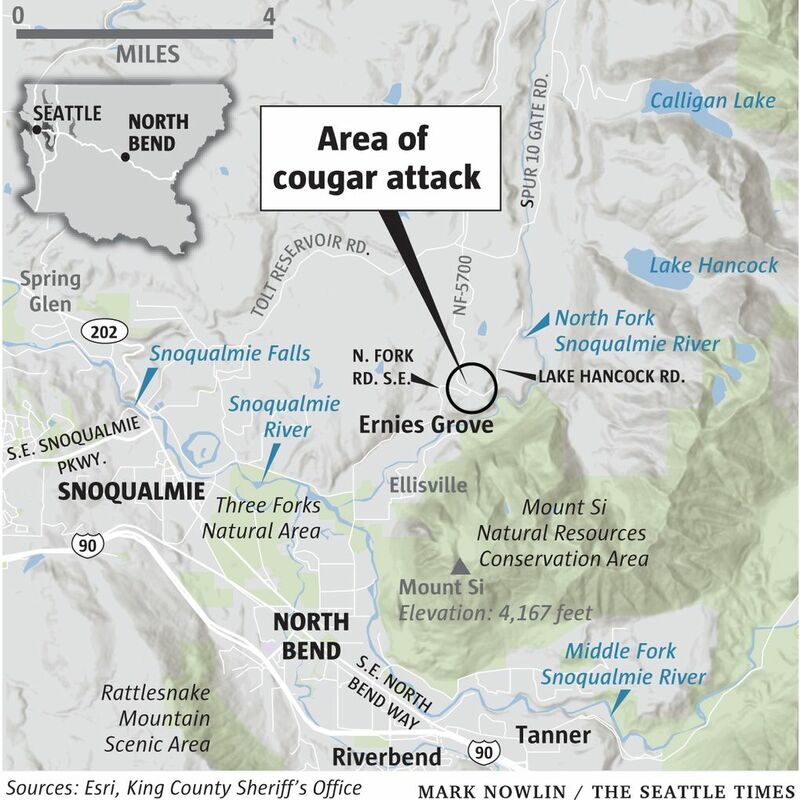 They were mountain biking on a remote, dirt road northeast of Snoqualmie on Saturday morning when they came across the cougar, which began stalking them and then attacked, according to police and Fish and Wildlife officials. Sederbaum suffered serious lacerations and bites to his head, neck and face, requiring surgery. He’s in satisfactory condition at Harborview Medical Center, according to spokeswoman Susan Gregg. Brooks was the director of operations at Hillman City Collaboratory, where grass-roots organizations and people share the space, and was a research assistant at William James College in Massachusetts. A Linked-In profile also states Brooks had been the office manager of G&O Family Cyclery in Seattle’s Greenwood neighborhood. While living in the Boston area, Brooks was a manager at Boston Center for the Arts and a bicycle mechanic. According to the profile, Brooks got a doctorate in the history of art and architecture at Boston University in 2016. Tom Fucoloro, founder of Seattle Bike Blog, wrote a story about Brooks who had started a Seattle chapter of Friends on Bikes to help women of color, trans and non-conforming people become interested in bicycling. While cougar attacks on people are not unheard of, this animal’s behavior was very abnormal, Myers said. Initially, the cougar started to chase them down the road. They stopped, made noise and one of them swung a bike at it in an attempt to distract and frighten it, which is what’s recommended during encounters. The animal appeared to have left, he said, but, instead, it circled back and pounced on Sederbaum’s head. “The cougar had his head in his jaws and was shaking him violently,” Myers said. Brooks dropped the bike and ran into the woods. The cougar abandoned its attack on Sederbaum and went after Brooks. “You are in a flight or fight situation – you are going to want to flee and it’s completely natural but it triggers a chase response in a cougar,” Myers said. Sederbaum, bleeding and seriously injured, rode two miles before he was able to find cellphone coverage and call 911. Myers described the animal — which was treed by dogs and shot a few hours later not far from the site of the attack — as an “emaciated” 3-year-old, 100-pound male. “It was skinnier than normal,” he said. Males that age typically weigh upward of 140 pounds, according to the Department of Fish and Wildlife website. Law enforcement found Brooks’ body had been dragged and partially concealed under a log near the gravel road. The cougar was on top of the body when officials first arrived. Myers said Brooks was severely mauled, with wounds to the legs, head, face and neck. While cougars are very common in the foothills of the mountains, attacks are rare. The last fatal attack in Washington was in 1924, when a cougar ambushed a teenage boy near his home in Olema, Okanogan County. Since then, there have been 18 nonfatal attacks in the state. There were nine cougar attacks in the 1990s, Myers said. Normally, cougars are secretive and aloof, said Myers, who has encountered many of them and has not felt threatened. They hunt and eat deer, elk, rabbits and small critters in the early morning, at dusk and evening. Males are solitary. On average, an adult male weighs 140 pounds, with females about 25 percent smaller. They have exceptionally powerful legs that enable them to leap 30 feet from a standstill, according to the Department of Fish and Wildlife. Rich Beausoleil, the state’s bear and cougar specialist, said that cougars are territorial, and they limit their own population growth to about two cougars per 39 square miles. Seattle Times news producer Jeff Albertson contributed to this report. Correction: Information in this article, originally published May 20, 2018, was corrected May 25, 2018. Due to erroneous information from the state Department of Fish and Wildlife, a previous version of this story incorrectly stated that there had been 15 nonfatal cougar attacks in Washington state in the past century, with seven of them coming in the 1990s. There have been 18 nonfatal cougar attacks in the past century, with nine in the 1990s.